Easy Dunker Dunk Tanks Are On Special for the Month of May! Just like you see in Movies or on T.V. Same style of Dunk Tank used in some Theme Parks. Very mobile, can moved into tight locations. Add optional, Heat on Fill. Available only from Tubby's Party & Event Rentals. $295.00 up to 4 Hours. Delivery charges may apply . Now $295.00 for Friday Bookings. Special Rates Do Not apply to Stampede Bookings. 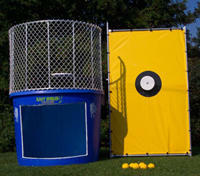 Dunk Tanks are an excellent add on to any Stampede Party or charity fund raiser. the tens of thousands of dollars over the years for charity. to fit most sizes and they all can be Heated. Are you looking at renting a Dunk Tank in Calgary or a Reverse Dunk Tank rental for a Birthday Parties, Bat Mitzvahs, Bar Mitzvahs, Family Reunions, Block Parties, Stampede Party or Event? A Larger Inflatable rental for a larger Community or Corporate events?